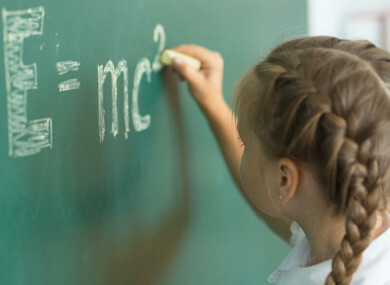 NEW MEASURES ARE to be rolled out in Irish schools to increase the uptake of subjects such as science, maths and engineering by girls. The targeted measures aim to boost the number of females taking STEM (science, technology, engineering and mathematics) subjects for the Leaving Certificate by 40%. The move is part of the Department of Education’s STEM Education Policy Statement 2017-2026. Education Minister Richard Bruton said today that he has an ambition to make Ireland’s education and training service the best in Europe by 2026. The initiative aims to increase the total number of students taking chemistry, physics, technology and engineering for the Leaving Certificate by 20%. A new primary maths curriculum, which will include creative and computational thinking and coding, is also due to be rolled out as part of the plan. Bruton said he also wants to accelerate the introduction of computer science at Leaving Certificate, with implementation due to be brought forward to September 2018. The minister also wants to introduce a new Junior Cycle mathematics and technology curriculum and also close the significant gap in achievement in STEM disciplines between students in DEIS schools and students in all schools. Achieving these goals will require a significant step-up in support to teachers and school leaders and will require innovation in teaching methods, said the minister. “There is a significant gender gap between the number of males and females studying STEM. In this plan I’ve put an increased focus on encouraging traditionally underrepresented groups, such as females, to participate in STEM activities. “We are increasing links between the education system and industry and putting in place supports to ensure our teachers feel confident to embrace STEM, in curricular, co-curricular and out-of-classroom settings,” said Bruton. Due to children living in a rapidly changing world, the education system must adapt to a “transformed economy and society” according to the minister. “Our children must be equipped with the necessary analytical, creativity and critical thinking skills to thrive in such an environment,” said Bruton. The changes to the curriculum are to take two years to implement. Email “Government aims to boost the number of girls doing maths and science in the Leaving Cert ”. Feedback on “Government aims to boost the number of girls doing maths and science in the Leaving Cert ”.